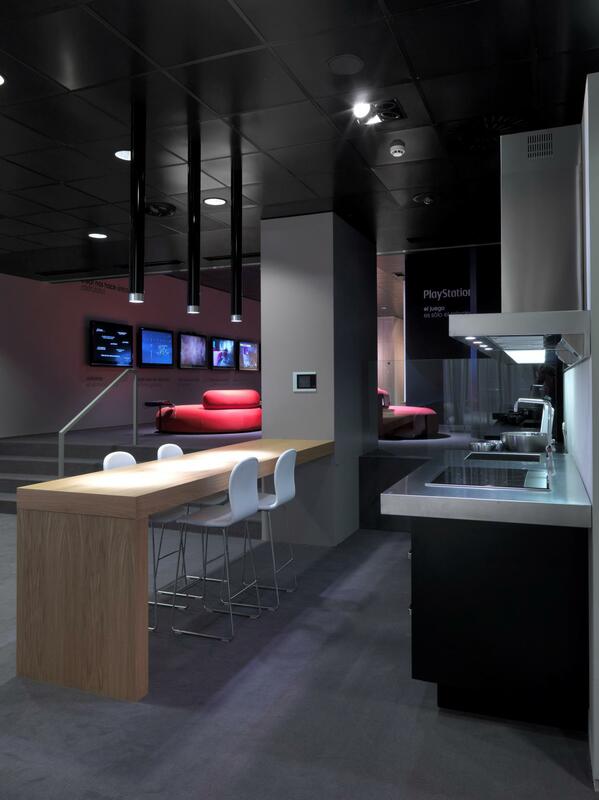 Estudio vilablanch realized an interior project of great aesthetic purity and large technical complexity, which made it possible to showcase the Sony products in an interactive way. 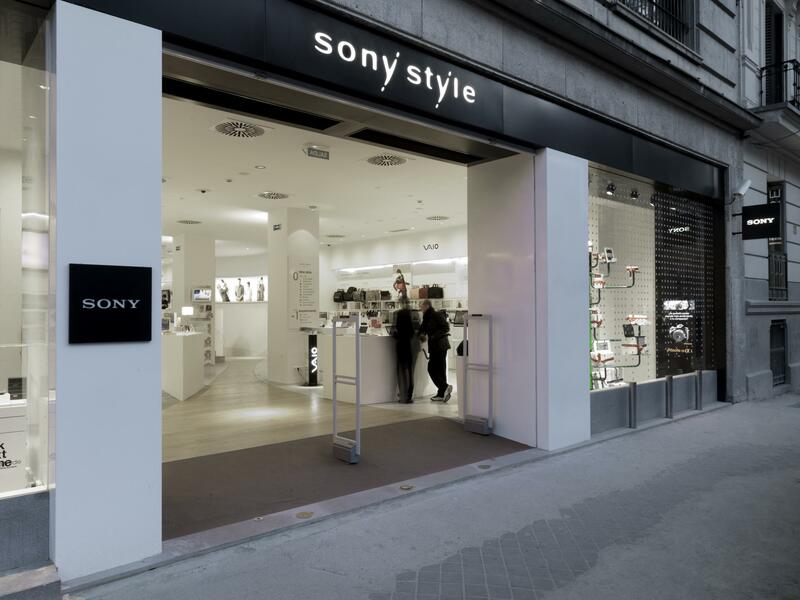 The Sony Style Madrid space is located on Serrano street number 12, in Madrid, next to the Puerta de Alcalá, and near the popularly called "Golden Mile". The shop has an important façade of 12 meters and a total area of ​​about 1,000 m2 that are distributed over two floors. The existence of two plants meant a challenge when it came to the design of the interior design: What use to assign to each plant? How could the access to the lower floor be stimulated? The floor at the foot of the street had an added architectural difficulty: three different levels that hindered circulation in the plant and constituted a barrier to the proper functioning of the store. The differences in level in the street plant were solved by ramps as a facilitator of circulation. 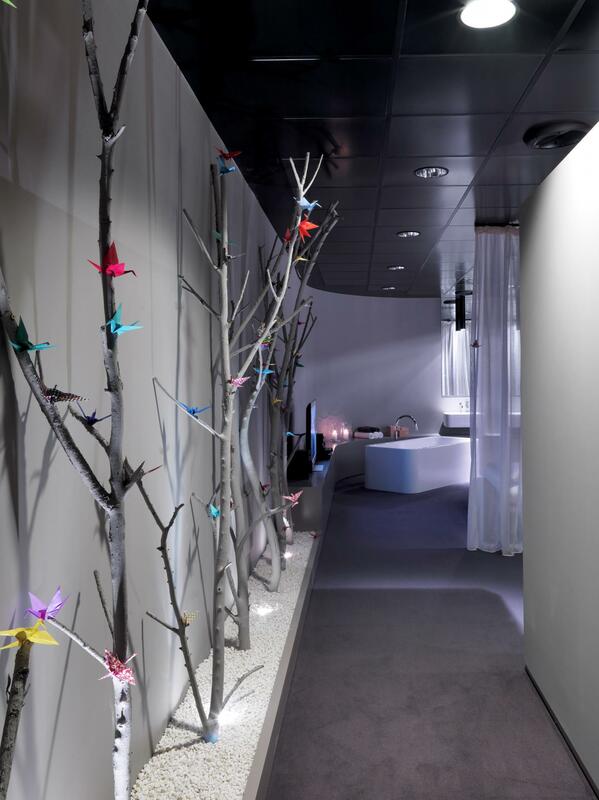 • The Sony product is displayed in environments that recreate a real home. • The Sony product can be played and experimented in specially conditioned areas, including three HiFI rooms. 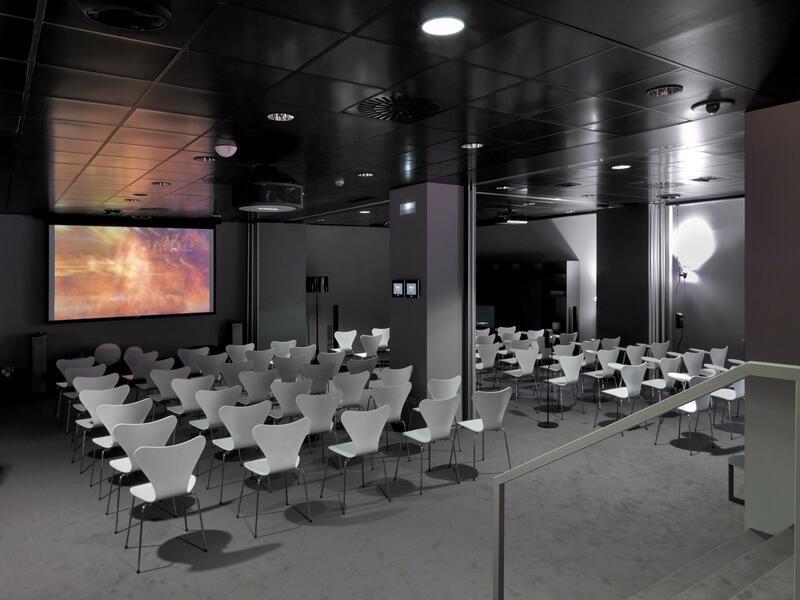 • The "Sony housing" is transformed into an event room and presentations, with capacity for more than 100 people. As we descend the ladder of the tent, we see on the right an area dedicated to the demonstration of Play Station games. 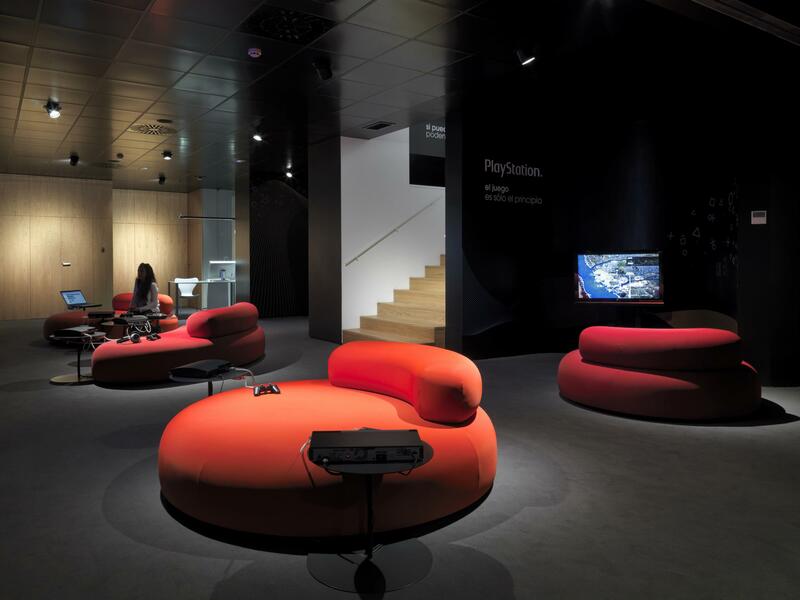 At the front of the stairs we find an interactive zone: a wall holds 7 Bravia televisions connected with Sony equipment that can be tried and tested from the comfort of three sofas of organic forms. These sofas are of the Living Divani brand. To the left we find a "Sony apartment", which recreates the different areas of a home: Kitchen, bedroom, bathroom, living room. This "apartment" is equipped with Sony product as it would be used in a real home. 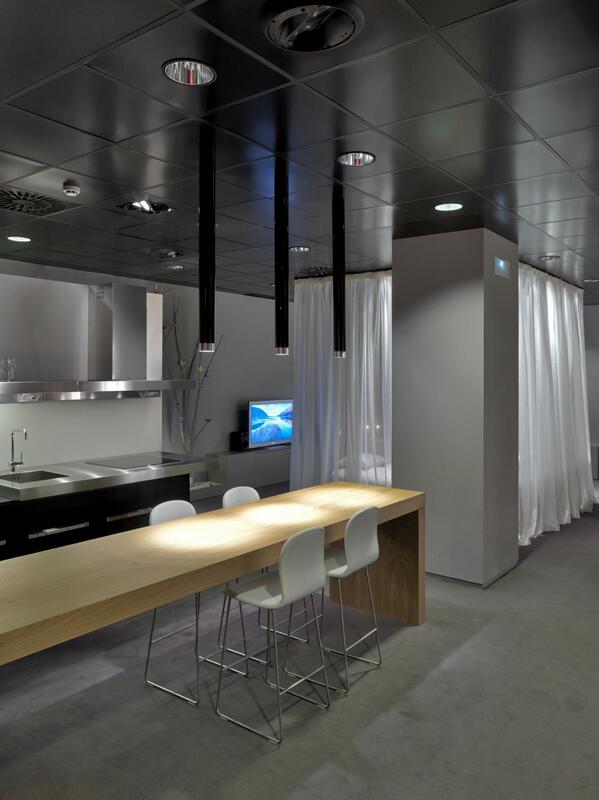 The Sony apartment can easily be transformed into a large room for events and conferences that can accommodate up to 100 people. The elements of the "Sony apartment", such as the bed and the large sofa, both of the Italian manufacturer Living Divani, are modular elements that easily decompose to create additional seats. 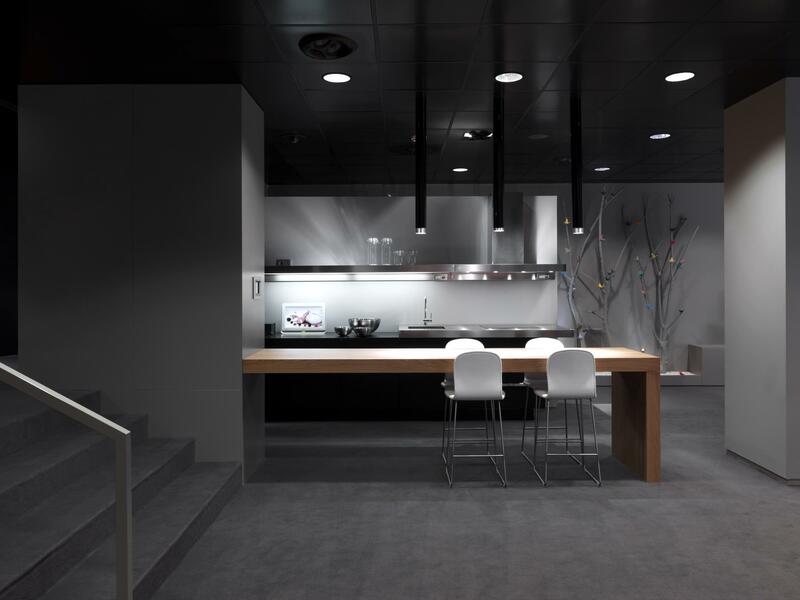 The kitchen is from DADA cucine, and the rest of furniture is from the Italian firms Molteni and Cappellini, all distributed by the vilablanch store. This area of ​​the floor can be zoned with mobile acoustic enclosures to create different configurations: two independent hearing rooms for demonstrations of HI Fi and Home Cinema, a medium-sized room with 30 seats, a larger room with 80 seats and even reaching more of 110 seats if the spaces are communicated and the furniture elements are broken down. This plant, rectangular, houses the store and exhibition of Sony products arranged in their different categories: Television (Bravia), Personal computers (Vaio), MP3 players and headphones (Walkman), photography (Alpha, Cybershot) and video (handycam), telephony (Sony-Ericsson), Hi-Fi audio, and Home Cinema. A ramp solves the differences in height and leads us towards the end of the store. 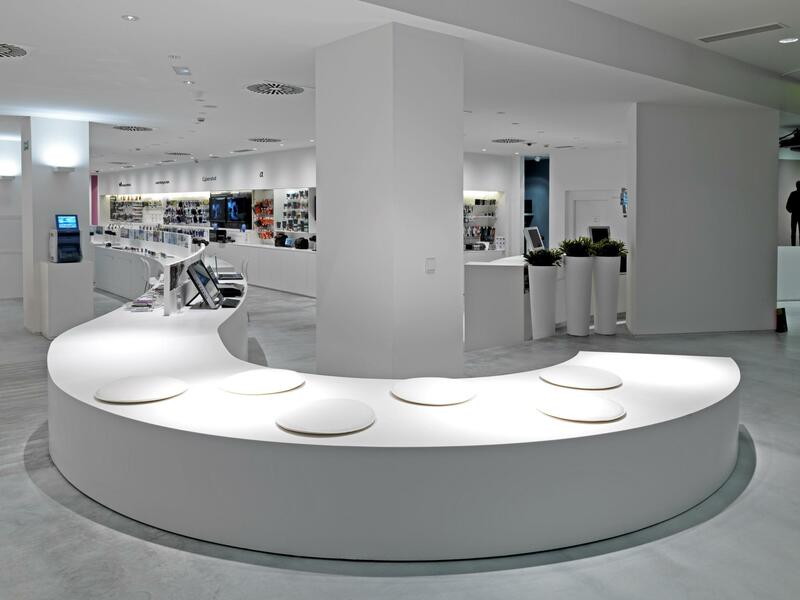 A large piece of furniture executed in Corian accompanies the tour on the floor from the entrance to the back of the store. This furniture brings fluidity to the space, stimulates the circulation, and serves as central exhibitor of the Sony product. This corian furniture accompanies the changes of vertical level of the store of smooth form and without ruptures, functioning like railing in the zones of ramp. Corian furniture is transformed into a work table and becomes a low bench to watch TV. A perimetral furniture designed to measure and that hides all the wiring of the equipment, it houses the rest of Sony product. The walls and ceilings are of plaster painting in white and the pavement is continuous in gray color. 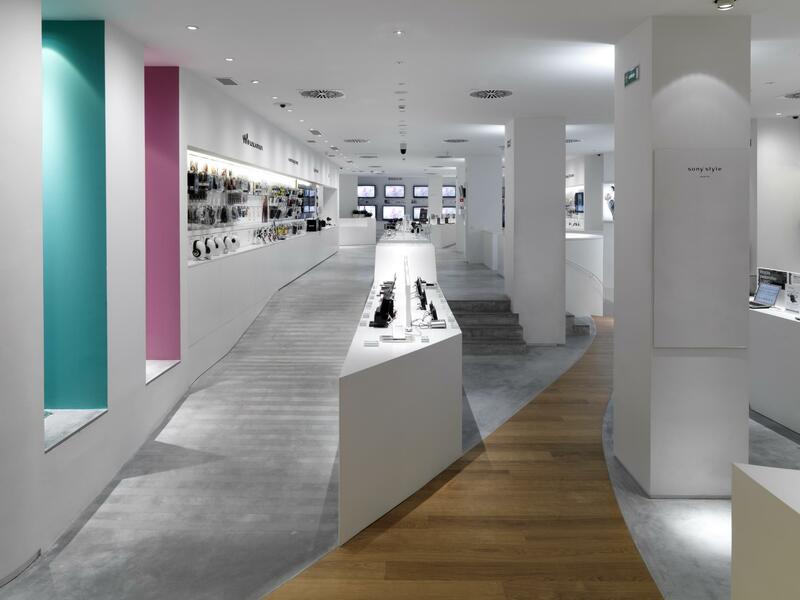 From the entrance, a curved parquet tongue guides us to the staircase leading to the basement floor, inviting us to visit this less accessible area of ​​the Sony Style Madrid store. 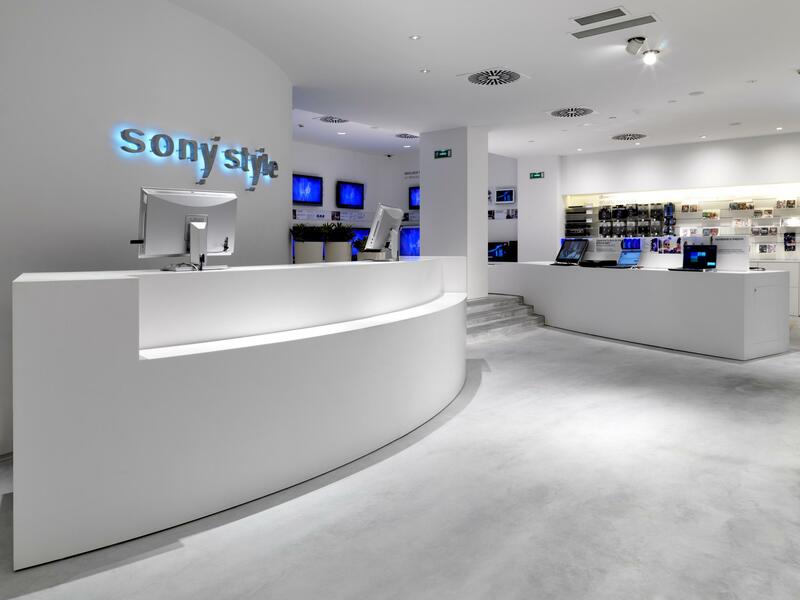 The façade of the Sony Style Madrid store, which overlooks Calle Serrano, is inspired by the shape of the 12-meter-long Japanese "tori". The shape of the door ("tori") is drawn in black lacquered iron. The columns separating the entrance to the premises and the two storefronts were lined with white stone.